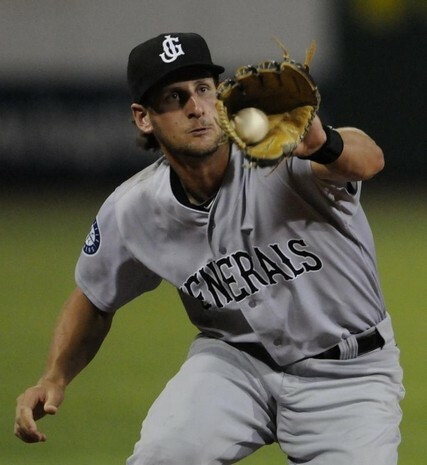 In 2011, Vinnie Catricala was the best player in the Mariners minor league system – two years later the Sacramento, California native is retiring from baseball. It has been a rough 16 months since earning Mariners Minor League Player of the Year honors in 2011. Catricala batted .349 with a .421 on-base percentage that included 25 home runs, 48 doubles and 106 RBIs during the 2011 season combined between High-A High Desert and Double-A Jackson. After moving up from High Desert, he batted .347 for the Generals in 62 games to close out the year. He actually finished against better competition in and posted a higher slugging percentage of .632 in Double-A. I remember a road trip to Mobile in August, 2011 and Mariners GM Jack Zduriencik paying a visit while on the east coast. The first thing I heard Zduriencik say was that he came to see this Vincent Catricala. He made an impact. In 2012, things began to go downhill. Catricala batted just .229 for Triple-A Tacoma in 122 games and posted just a .348 slugging percentage. He hit 10 home runs and drove in 60 runs, but had an on-base percentage under .300. Catricala was demoted to Jackson beginning 2013 and his struggles continued as he hit just .253 with 3 home runs and 21 RBIs in 48 games. He was designated for assignment on June 2nd. The Oakland Athletics snagged him off of waivers and assigned him to Double-A Midland. He hit just .229 the rest of the season and had an infamous one-pitch strikeout. Catricala was then designated for assignment by Oakland at the end of the season, but cleared waivers. The Milwaukee Brewers selected him in the Rule 5 draft this past December and he probably would have begun the season with Triple-A Nashville had he not chosen retirement. Catricala played a total of 110 games in Jackson in 2011 and 2013. We should wish him well.